KOBANI/BUDAPEST A Syrian father on Friday buried his wife and two little boys, drowned as they tried to flee to Europe, while Hungary's right-wing leader told Europeans they risk becoming a minority on their own continent. In neighbouring Austria, police said the driver of a truck found abandoned last week with the bodies of 71 migrants in the back was among a group of people arrested in Hungary. Images of the tiny body of Aylan washed up on a beach near the Turkish resort of Bodrum gave a human face to the high death toll and prompted a global outpouring of sympathy this week. He drowned with his brother Galip, his mother and at least nine others while trying to cross in two small boats to the Greek island of Kos just a few kilometres away. "I want Arab governments — not European countries — to see (what happened to) my children, and because of them to help people," he said in footage posted online by a local radio station. The head of the United Nations' refugee agency, Antonio Guterres, called on Friday for the European Union to mobilise its "full force" to help the migrants. In southern Hungary, police gave chase as about 300 migrants fled the crowded reception centre in Roszke on the border with Serbia. Another 2,300 migrants still inside were threatening to break out too, and the MTI state news agency said dozens more had fled a second camp west of Budapest in the town of Bicske. Hungary says it is enforcing EU rules that it must register all migrants caught crossing its borders, but thousands are refusing and demand they be allowed to continue their journey to western Europe. Germany has said it will let Syrians register for asylum regardless of where they entered the EU, causing confusion among neighbouring countries who have alternated between letting them through and stopping them. In Bicske, around 500 migrants were spending a second day stranded on a train at the local railway station, refusing the demands of riot police that they disembark and go to a nearby migrant reception centre. "No camp. No Hungary. Freedom train," someone had written with shaving foam on the side of the train. Sanitary conditions were deteriorating fast in the late summer heat. The UN refugee chief's appeal contrasted with the tough line from Hungarian Prime Minister Viktor Orban, who warned about the consequences of "a mass inflow of people", which he said could possibly number tens of millions. "It now has no other choice but to mobilise full force around this crisis. The only way to solve this problem is for the Union and all member states to implement a common strategy, based on responsibility, solidarity and trust," Guterres said. The arrival of so many migrants has polarised Europe, causing outpourings of sympathy but also fuelling the rise of populist political parties who say the continent has no room for more people and could see its cultures diluted. With the pressure growing, British Prime Minister David Cameron said his country would take "thousands more" refugees from Syria. Until now, Britain has taken in only comparatively small numbers of Syrian refugees, drawing criticism at home and aboard. Frankly , I am more worried about Europe drowning in a sea of immigrants . Middle easterners threaten to convert civilized Europe into one more barbaro-land . Last edited by ashdoc; September 4th, 2015 at 10:46 AM. As long as they don't flood India or US ....who cares! My FB status yesterday on hearing this news. Rich countries like Bahrain, Kuwait, Oman, Qatar, Saudi Arabia, UAE are next door but Syrian Refugees'‬ infants being murdered in attempt to get to EU. 1. if the father and family were fleeing Syria why and how did he return to the same Syria to bury his son ? 2. Why did the father go all the way to the sea to escape when he could have simply crossed over to Jordon and then to his own muslim families in Saudi, UAE, Kuwait, etc? 3. Why haven't a SINGLE OIC country made any statement or volunteer to take their own muslim refugees? 4. Why should the Western white infidels and their countries share the guilt and the Muslim countries share no blame whatsoever? 5. 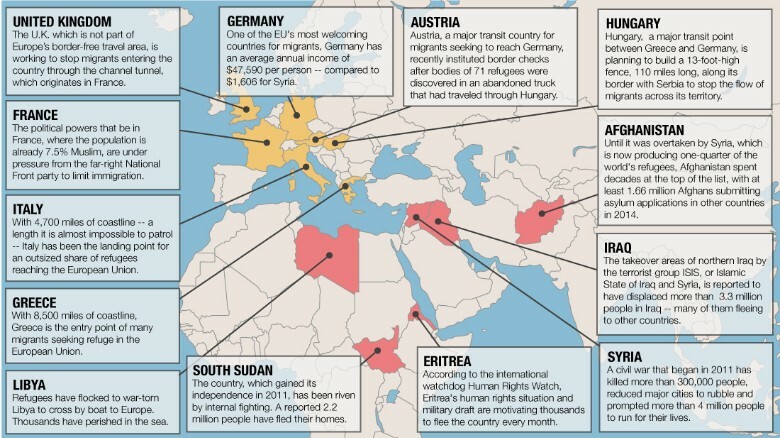 Why aren't the muslim countries offer money - at least - to support the refugees? 6. Why aren't the cartoon protesters launching a worldwide "spontaneous" protest at ISIL - the reason the refugees are fleeing? I got fed up of rop folks on my FB timeline posting this pic of the dead child. As sad as it is, and I was moved by the disturbing image, one has to think of things in totality. Why is it that one hears of big things about Islamic brotherhood, but its only talk. Different categories or sects of Islam are treated very differently in their countries, one can only imagine what a Hindu or Christian would go through. some of them committed so many crimes against India/Redindians & other nations. Pakistan(permanent trouble for India) is creation of Britons. some of them committed so many crimes against /Redindians & other nations. It's all talk & no substance. Blood thirsty evil cult under the garb of religion. mexicans are not going to do anything drastic . they are relatively normal people . Last edited by ashdoc; September 5th, 2015 at 04:13 AM. EUROPEANS are in turning point. Yes, only later the EUROPEANS will understand how Germany lured them into committing collective suicide. Most of the posters here are Indians who are having fun and wondering at the zeal of self-destruction of EUROPEANs. We are not under threat and this is a threat we will not face in foreseeable future, not because the chance of threat is not there but because we are aware and our people have enough power, unlike Europe where the power is concentrated in the hands of few so called leftist intellectual and politicians, to prevent our Govt. to take any such moronic decision. I understand how you think that we are of mediocre minds, given that a fool can never realise or comprehend the intelligence of a truly wise person and his vision. We have enough wisdom to understand that 'IF' Europe doesn't deal with this situation harshly, Europe is doomed. A wise man can analyse a situation and comprehend the future effect of the same by the method of handling of the situation. A wise man first thinks of his own. But, Europe lacks the wisdom. And that is also no wonder, given how Europeans have been given the dose of Left-Liberal ideologies for last generations where freedom of thought and speech is severely restricted only to allow Left-Liberal ideologies to spread. The victim was nationalism. The Nationalists are villains of the new order! This crisis will potentially collapse the economic security of Europe including much touted social security system as the productive section of society will have to bear the cost of rearing an uncooperative, uneducated, unskilled group of people who does not integrate or accept the social values. Last edited by ashdoc; September 5th, 2015 at 05:08 AM. The fact remains this stupid decision by Merkel is the beginning of demographic change in Europe, we Asians (Indians,Chinese,Japanese &others)understand the implications of large scale demographic and theocratic changes better than most. Mark my words "10years from now Islam shall be a defining political force in Europe opposed only by those some would call fascist, the stupidity of European leaders today shall be the root cause of balkanization and multiple civil wars of tomorrow" .We shall be among those unfortunate souls who shall see the domes of st peter fall to the crescent sword of Islam.The sun of the Viking has set, the sun of the Moorish conquest of Europe dawns on this world.